In April 2014 94 year-old retired Supreme Court Justice John Paul Stevens published a short book entitled Six Amendments: How and Why We Should Change the Constitution. Stevens served on the Supreme Court from 1975 to 2010, and at the time of his retirement was the second-longest serving justice in the Court’s history (judicial term limits anyone?). He is the first retired justice in the Nation’s history to undertake such an effort, and his effort has gathered considerable notice. It has even impacted one amendment proposal already. Other commentators have addressed the substance of his proposals (for example here and here). In this post I want to look at Justice Stevens’ proposed amendments from another angle. I want to briefly analyze how well they are written. It may be argued that it is rather cheeky for an everyday working lawyer to presume to correct the drafting of a Supreme Court justice, but I think I can bring a couple of skills to such an effort. First, I have spent my legal career drafting contracts, often in a small business context where my clients and the other party would actually read the contracts. As dull as contractual writing is, it does force the draftsman to be as clear as possible, both to state the parties’ intent and to avoid unintended readings. 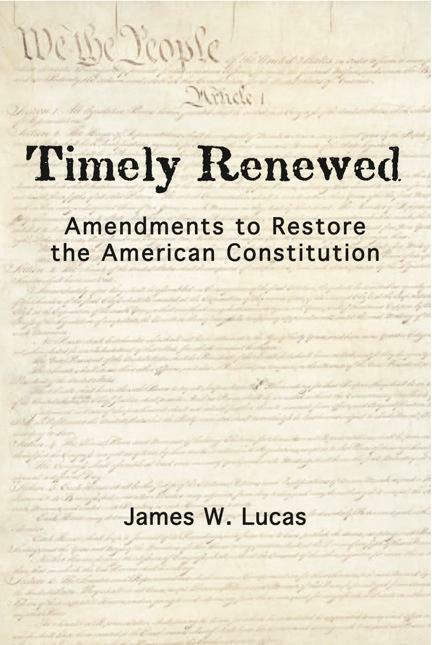 Second, I put myself through the exercise of drafting (and redrafting in later editions) many constitutional amendment proposals in writing my book Timely Renewed: Amendments to Restore the American Constitution. Amendment drafting poses particular challenges. One must try to be precise without being so wordy that the proposal reads like a statute rather than a fundamental law. Stevens’ proposals run all over the lot with regard to subject matter. What links them is that they are all intended to reverse Supreme Court decisions in which Justice Stevens was in dissent. In fact, much of the book consists of Stevens rehashing or quoting from his dissents, which makes the book a bit of a slog despite its short length. The other linkage is that each amendment increases the power of government, and of the federal government and of federal judges in particular. As we will see, this latter observation bears on the drafting of Stevens’ proposals. So, let’s look at the proposals. Rather than follow the order in the book, this post will take them in order of their level of public controversy. Gun control. Stevens proposes amending the Second Amendment to read (changes are in bold): “A well regulated Militia, being necessary to the security of a free State, the right of the people to keep and bear arms when serving in the Militia shall not be infringed.” The change is designed to override the Supreme Court decision in Heller v. District of Columbia which recognized an individual right to bear arms, and somewhat limited restrictions on gun ownership. Stevens’ change is based on the view that the Second Amendment was only about preserving state militias from federal interference, not protecting an individual’s right to arms. Campaign Finance. Stevens proposes an amendment reading “Neither the First Amendment nor any other provision of this Constitution shall be construed to prohibit the Congress or any state from imposing reasonable limits on the amount of money that candidates for public office, or their supporters, may spend in election campaigns.” The word “reasonable” is one of lawyers’ worse drafting cheats. It is the word you stick in when you can’t really agree, and need to smooth over a point. Basically, it is the parties saying “we’ll let the judge decide if it ever becomes a problem.” We get away with it in contracts because the vast majority of contracts never get disputed, and rarely go to court. However, this constitutional provision is certain to be litigated extensively. So, what Stevens is saying by inserting the cheat word “reasonable,” is that judges will dictate what campaign finance laws should be. Aside from the substantive problem this presents of increasing the power of unelected federal judges over our most fundamental democratic act, this is poor drafting for a lot of reasons. One is that legislators and people running for office will never really know what the campaign finance rules are since court decisions come after the fact. Another problem is that, ironically, the purpose of the proposed amendment is to reverse the Court’s decision in Citizens United v. FEC, which allowed corporate bodies such as businesses and labor unions to spend money expressing their views on election issues. Reasonableness is a sufficiently vague standard that a future court could readily find that the campaign finance laws struck down in the Citizens United case were unreasonable, and still invalid. This is an important point for anti-Citizens United amendment proponents, because the Democrats’ proposed amendment introduced in the last Congress included Stevens’ “reasonable” requirement. Death Penalty. Stevens would amend the Eighth Amendment as follows (new words in bold): “Excessive Bail shall not be required, nor excessive fines imposed, nor cruel and unusual punishments such as the death penalty inflicted.” If you want to abolish the death penalty that’s fine, but “such as”? What punishments are “such as” the death penalty? “Such as” is language that a draftsman uses when he or she is too lazy or dumb to think through the possible scenarios. Once again, by introducing unnecessarily vague language, Stevens is basically saying that judges will decide if something is sufficiently close to the death penalty to be “such as” it. Considering the finality of the death penalty, one wonders what punishment might meet this standard. In fact, while eliminating the death penalty, this language might actually loosen the limitations for other harsh punishments by being found to define “cruel and unusual.” A court could rationally find that anything that was not life-threatening “such as the death penalty” was not “cruel and unusual.” Current news brings to mind waterboarding as an example. Since our intelligence agencies are so convinced of its efficacy in foreign situations, why not use it to interrogate convicted prisoners? Harsh as it is, properly administered it is apparently not fatal “such as the death penalty.” The Eighth Amendment terms “cruel and unusual” are already vague enough without introducing more uncertainty into this important provision of the Bill of Rights. Any lawyer who could not drive a semi-trailer through a loophole as broad as “criteria such as natural, political, or historical boundaries or demographic changes” should lose their law license. And if all of those gaps were not enough, there is “such as” again to allow a court to find any other criteria acceptable. I am especially keen on this issue because I wrestled with the problem of an anti-gerrymandering amendment when writing Timely Renewed. My conclusion was that the only amendment which could not be circumvented was one with arithmetic standards. (My proposed anti-gerrymandering amendment is in chapter 11 of Timely Renewed. It provides a simple numerical formula to define acceptable compactness of legislative districts.) Justice Stevens’ amendment is too vague to be meaningful, which means that the intensely political decision of legislative redistricting would be decided by judges rather than democratically accountable legislators. Sovereign Immunity and the “Anti-Commandeering Rule.” Stevens’ other two proposals are really quite arcane. One is to bar state governments from having “immunity from liability for violating any act of Congress, or any provision of this Constitution.” The other is to allow the federal government to give orders to state officials by subjecting “public officials” to the “supremacy” clause in Article VI of the Constitution. I will not bore either you or me with the arcana behind these proposals. It is worth noting that even someone as sympathetic to Stevens’ ideology as Cass Sunstein does not think that these are important enough to require constitutional amendment. I will only note that, with both of these proposals, Stevens commits another too common drafting error. When parties are immersed in a deal point, they can write it into the contract in a shorthand which they both understand but which oversimplifies a sometimes complex understanding. I could not count the times I have given the little spiel about how the contract has to be comprehensible to someone who knows nothing about the deal, and therefore sometimes points which are obvious to the parties to the negotiations have to be spelled out in some detail in the contract. While a constitutional amendment in particular has to speak in general language, in doing so Stevens has failed to spell out his specific objectives, and thus opened wide possibilities for alternate readings. For example, it does not follow from subjecting state officials to the supremacy clause that federal officials can give them orders just by virtue of being federal officials. A court could easily interpret Stevens’ revised supremacy clause to mean just that state officials can not violate federal law, which is different than empowering federal officials to command the services of state officials (all without compensating the states for the officials’ time by the way). Similarly, simply saying that state officials are not immune from liability does not say what kinds of liability that covers. Liability is a very complex area of law, and Stevens’ proposed language could be read to still bar the kinds of lawsuits he wants to allow. This same problem runs through Stevens’ other proposals as well. He is too immersed in the arcana of the Supreme Court decisions to which he is objecting to step back and see how else his language might be interpreted. As a Supreme Court justice, he grew used to having lawyers parse his lengthy opinions for the fine points of his rulings. In their opinions, Supreme Court justices can elaborate at length on the meaning of their rulings because those opinions are the law. I have to wonder if Justice Stevens quite realizes that his book is not a Supreme Court opinion. Future courts will not be bound by his book the way they theoretically would be by his Supreme Court opinions. Consequently, his proposed amendments would have to stand on their own careless wording, unassisted by his explications in Six Amendments. Of course, it is possible that his objective with this too often vague and imprecise language is to put more power into the hands of federal judges. However, this lawyer, for one, thinks that federal judges already have entirely too much power, and can pass on Justice Stevens giving them even more.